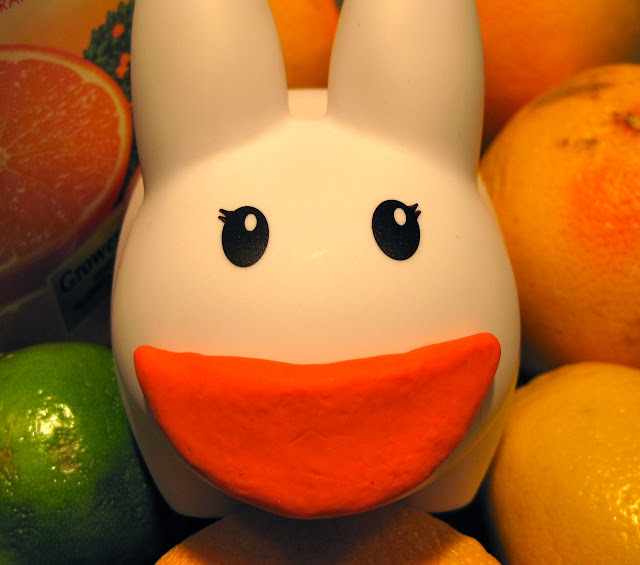 Year of the Labbit: Orange You Glad? Make face for happy mouth! Clover used oven bake sculpey clay to make a couple new accessories for the labbits: this orange peel smile and...well, you'll have to come back tomorrow to find out! She's excited to make all sorts of accessories. Do you have any suggestions? The labbits have cigars, (although smorkin' is bad for your health) bubblegum, ice cream, candy cane, mustaches, a Groucho disguise nose/'stache/glasses, a present, a light bulb, elf legs, tongue, and banana. Leave a comment below and Clover will see what she can bake up!